Death is part of life itself and as in the previous games, The Sims 4 features a series of different ways to die. Drowning is the only traditional way to die that has been removed since there’s currently no swim pools in game, however all the other ways are still available. There’s also three new ways to die originated from the new dynamic emotion system. If you’re looking for different ways to kill your sims, then keep reading. The basics of life are always present in The Sims, which makes it no surprise that eating is essential to keep your sims alive. Food restriction for too long will lead your sims into imminent death. How to trigger this death: Abstain from eating for several days. No one lives forever and there’s nothing more full-filing than living a complete long life. In The Sims 4, players can live properly during their elderly phase but eventually their body will give up and natural death will occur. How to trigger this death: Live a healthy life until the end of your elder days. Being cautious in the kitchen will mostly avoid this type of death but it can always happen, especially if your sims is not experienced enough in culinary methods. When you’re caught by a fire and you’re unable to extinguish it in time, your sims will be consumed by the flames. How to trigger this death: Start a fire and let the flames get close. A good way to trigger a fire is to use a cheap oven and an inexperienced cooker. Another death path that has been featured in all Sims games is the electrocution. This is not an easy way to die, simply because the chances to get electrocuted are low. Still, your sims can suffer an accident and be shocked to death, literally. How to trigger this death: Repair electronic objects repeatedly with a handiness inexperienced sims. Eventually, the event will generate. Going beyond your body’s capabilities in The Sims 4 will activate an unexpected way to die, death by overexertion. This type of death can occur at any age from the young adult stage beyond and there’s several ways to trigger it. How to trigger this death: Push your sims to the limits with physical exercise (until you get the -40 sore uncomfortable moodlet), then WooHoo. Your sims will go over the limits and perish. Dying from embarrassment sounds ridiculous but it’s one of the new death possibilities in The Sims 4. To unlock this death you need to humiliate your sims in many ways. Peeing in your pants, having an awkward social encounter or having another sims invading your privacy will drive your sims insane and overly depressed, which can be lethal. How to trigger this death: Embarrass your sims in several ways until he/she can’t handle it anymore. Another death generated by emotions is the laughter. It literally means that your sims can die from laughing too much. Just as the electrocution, this event has low probabilities to happen so patience is the main key. How to trigger this death: Get your sims into the playful mood and repeat jokes and funny interactions. 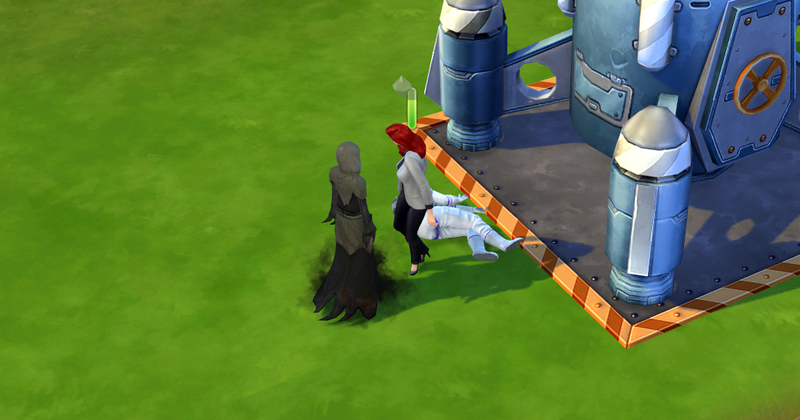 Mature Cow Plants can devour sims causing immediate death. This type of plant is rare and hard to get, you can see how to get one here. How to trigger this death: Try to get the Cow Plant’s cake. Even though this is not a real death it works as such. If sims don’t take proper care of their child, the social services will take them away and there will be no further contact, working as if the child died (at least to the family). How to trigger this death: Do not feed your child for several days. Here’s a full list of possible ways to kill your sims but be aware that ghosts do not exist anymore and certain deaths won’t leave a grave behind.